Every year about the time bucks shed velvet they begin actively seeking a source of carbohydrates to consume. This drive to consume carbohydrates is a given annually. The Creator timed this perfectly as this is the time many sources of carbohydrates are becoming available such as acorns, corn, etc. Hunters in agricultural areas may not notice this dietary shift as deer often shift from the soybean to the adjoining corn field and still use the same bedding areas. Often times the bedding areas are the corn fields. I call production corn the annual forest as it grows tall enough to provide cover and is “clearcut” on an annual basis. However, in areas that are primarily forested such as my neighborhood, deer may not find sources of carbohydrates as readily as deer living in the corn/soybean belt. Deer living in areas where forests are the primary cover type often readily seek acorns as a source of carbohydrates. Deer seeking acorns can be difficult to pattern. Given this and the knowledge that deer annually seek carbohydrates this time of year, a grain crop in food plots can be a huge attractant during the hunting season. This is true in areas with agricultural and forest cover types. Most commercial agricultural fields are harvested by early to mid hunting season. However, having a grain crop, such as soybeans, corn, or milo to benefit and attract deer during hunting season can be a huge advantage! This requires the food plot farmer to plan ahead. Grain production occurs during the summer growing season. If food plots are not planted until late summer, the only option is to produce forage during the hunting season. The traditional “green fields” will attract and benefit deer. However, grain tends to be a better attractant during the fall and carbohydrates are usually in a more limited supply than protein. For great hunting during the fall, try planting a grain producing crop like soybeans, corn, or milo. 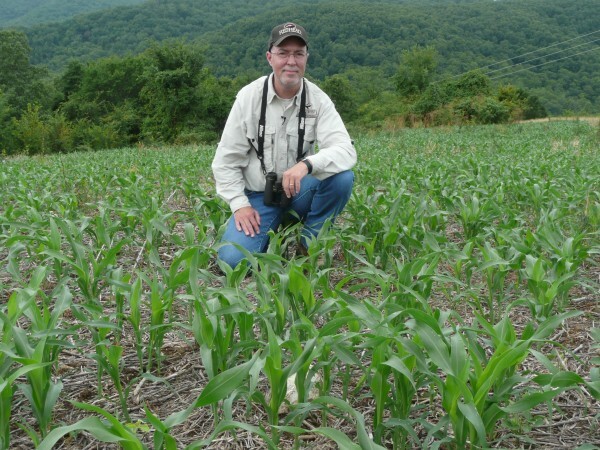 Standing grain provides a great source of energy for deer and can be a great stand location.